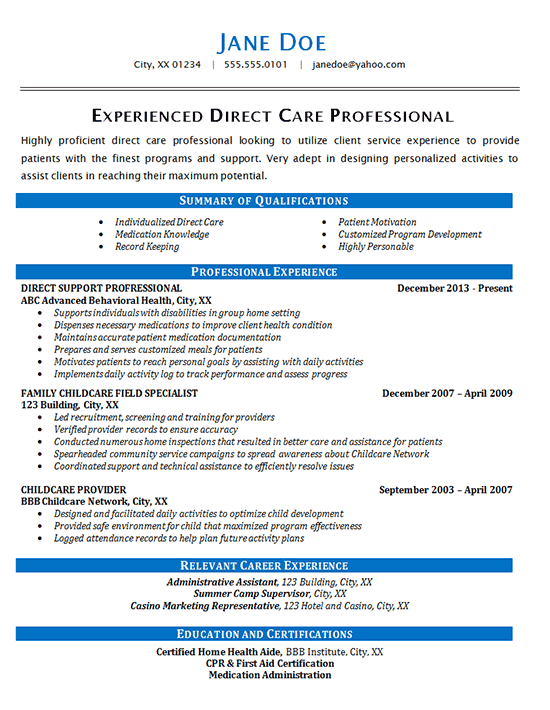 This Direct Care Resume was created for an experienced Direct Care Professional. She was simply looking for a change and wanted to see what job openings were out there. The education section was slightly challenging because she didn’t have a degree, though she did attend college.Fortunately, she did have multiple certifications that are relevant to her field. A brief objective statement was used to begin the resume to tell employers what she is looking for in employment. From there, the writer decided to highlight some positive characteristics that would interest potential employers looking for Direct Care Professionals. This job seeker did a nice job of implementing plans and routines specific to patient needs, so the resume included phrases such as “customized program development” and “individualized direct care” in her resume. Employment history was separated into two sections, “Professional Experience” and “Relevant Career Experience”. This was done so the majority of the resume focused on the most relevant positions to her career interests. The writer went into detail on the candidate’s patient care positions and simply listed other positions. Highly proficient direct care professional looking to utilize client service experience to provide patients with the finest programs and support. Very adept in designing personalized activities to assist clients in reaching their maximum potential. Supports individuals with disabilities in group home setting. Dispenses necessary medications to improve client health condition. Maintains accurate patient medication documentation. Prepares and serves customized meals for patients. Motivates patients to reach personal goals by assisting with daily activities. Implements daily activity log to track performance and assess progress. Led recruitment, screening and training for providers. Verified provider records to ensure accuracy. Conducted numerous home inspections that resulted in better care and assistance for patients. Spearheaded community service campaigns to spread awareness about Childcare Network. Coordinated support and technical assistance to efficiently resolve issues. Designed and facilitated daily activities to optimize child development. Provided safe environment for child that maximized program effectiveness. Logged attendance records to help plan future activity plans.